Max has land on a lake and wants to maximize his view of the water, but first he needs plans, a basement, framing, a roof, drywall and a porch. The pictures feature heavy equipment, scenery, and the outline of the house as it is built. Young aspiring builders will appreciate the detailed drawings and step-by- step process of what goes into building a house. Parents who are having a house built can use this story to explain to their children why it seems to take forever—after all, there a lot of steps and it’s sometimes hard to wait for them to be done. Anyone (kids included) who has ever been fascinated when passing a construction site will appreciate the detail and depth of the illustrations. Newhouse, the aptly named author, worked on the book on a stage at James Whiteside Elementary School in Richmond, British Columbia. He has illustrated Laura Secord: A Story of Courage and The RCMP Musical Ride; he was a finalist for Canada’s Governor General Literary Award in Children’s Illustration. Newhouse’s writing doesn’t always keep pace with his wonderful illustrations. 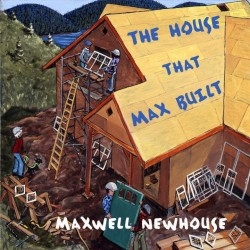 When the roof is being built, Max says, “There are many kinds of roofs to choose from and I want one that keeps out the rain and snow.” That would be the kind everyone would choose, wouldn’t it? But Newhouse has a knack for not only architectural renditions; he handles people and scenery well. Seasons change, progress is made and, throughout the book, he never skimps on the attention to detail.